Just as it was recently reported in Ghana, the Lagos State Police Command says it has discovered a fake embassy operating in Lagos where many innocent members of the public had allegedly been defrauded, report according to Punch Newspaper detailed. Similarly, fake United States of America embassy, which has operated for over a decade was discovered in Ghana, with many defrauded. 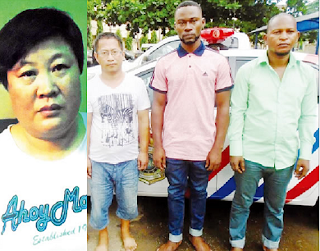 It was gathered that policemen attached to the Rapid Response Squad (RRS) had swooped on the ‘embassy’ and arrested two Chinese and two Nigerians. The fake embassy was located at Golden Point and Suite on Duduyemi Street in Ejigbo, Lagos. The RRS said the Chinese – Liu Honyang, 47; and Sun Xinai, 49 – and their Nigerian collaborators – Oriyomi Olawale, 47 and Desmond Chinedu, 25 – had been swindling Nigerians who had planned to travel out of the country. It was learnt that the suspects issued mainly Trinidad and Tobago’s visas. The RRS said the Trinidad and Tobago embassy in the country had confirmed the visas to be fakes, while disowning the two Chinese. Some people, who claimed to be victims of the fraud, stormed the RRS headquarters on Sunday to write their statements against the suspects. One of the victims, Adekunle Adefuye, said he met them through one of their agents, one Dorcas Slyver. He said, “She is a daughter to my brother’s pastor in Abeokuta, Ogun State. I told her about my intention and zeal to travel to the United States. She told me to come to Lagos that she could procure the American visa for me. “On getting to Lagos, she took me to the Chinese and I was advised to travel to Trinidad and Tobago. They said I would secure employment with at least $3,000 salary. He said he was arrested immediately he got to Trinidad and Tobago on October 19, 2016, by the country’s immigration officers for coming into the country with a fake visa. “I was arrested with another Nigerian. We spent two days with the police. They treated us like criminals trying to enter the country illegally. We were deported on October 22, 2016, and arrived in Nigeria the following day,” he added. Another victim, Rasheed Ololade, said he paid N1.3m. “I was fortunate to escape being jailed in Trinidad and Tobago for coming into the country with fake documents. “They beat me up and starved me for two days. I was lucky to have been deported,” he added. Another victim, Friday Owah, said he just paid N600,000 before the arrest. Another victim, Lukmon Odeyemi, who claimed to be a footballer, said he parted with N125,000. But Sun Xinai, the main suspect, said she was unaware that a stamped visa for Trinidad and Tobago was no longer tenable in the country. However, a response to a letter written by the RRS to the High Commission of the Republic of Trinidad and Tobago, dated December 7, 2016, read in part, “…the mission can categorically confirm that the individual Sun Xinai, who is claiming to be an agent of this mission, is unknown to us. “Furthermore, this mission does not use the services of an agent in any capacity whatsoever and has never done so in the past either. The letter was signed by one Garth Lamsee, the acting High Commissioner. The state Police Public Relations Officer, SP Dolapo Badmos, said the police had launched a manhunt for other agents of the fake embassy. “Members of the public should be wary of visa agents. Anyone who wishes to travel out of the country should direct their applications to the embassies,” she added. She said the suspects had been transferred to the State Criminal Investigation and Intelligence Department, Yaba,for further investigation.